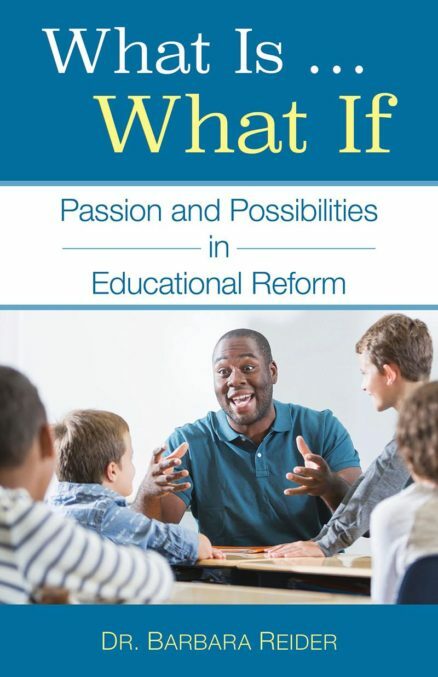 What Is … What If: Passion and Possibilities in Educational Reform is a roadmap for school reform looking at present factors that inhibit excellence in teaching as well as presenting possibilities for teachers to maintain their passion and create learning environments for student success. What Is … What If is also available through Amazon and BN or ask for it wherever books are sold. The ebook version of this book can be ordered through Amazon. Available May 1, 2019 ~ Pre-order today! What Is … What If is a roadmap for school reform looking at present factors that inhibit excellence in teaching as well as presenting possibilities that encourage teachers to maintain their passion and create learning environments for student success. The What Is section of the book speaks to the factors that exist in schools today that have created widespread disenchantment among teachers and administrators and stripped teachers of their passion to teach. Such an atmosphere decreases the potential for excellent learning environments and therefore student success. 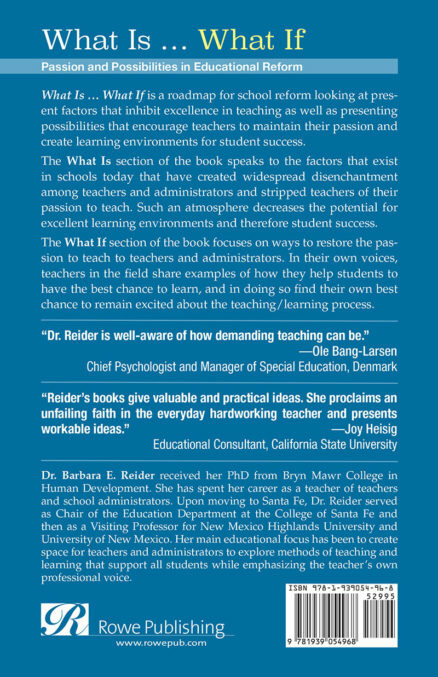 The What If section of the book focuses on ways to restore the passion to teach to teachers and administrators. In their own voices, teachers in the field share examples of how they help students to have the best chance to learn, and in doing so find their own best chance to remain excited about the teaching/learning process. Dr. Barbara E. Reider received her PhD from Bryn Mawr College in Human Development. She has spent her career as a teacher of teachers and school administrators. Upon moving to Santa Fe, Dr. Reider served as Chair of the Education Department at the College of Santa Fe and then as a Visiting Professor for New Mexico Highlands University and University of New Mexico. Her main educational focus has been to create space for teachers and administrators to explore methods of teaching and learning that support all students while emphasizing the teacher’s own professional voice. EDITORIAL REVIEW – Dr. Reider instilled in me, long ago as a pre-service teacher, the role teachers play in transforming educational systems and the power they have to create critical shifts to ensure meaningful and impactful learning for all learners. 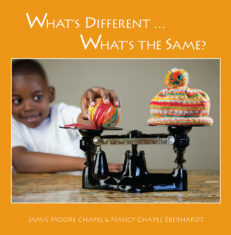 The title of her book, What Is … What If speaks to the spirit of her work as a teacher, leader and author and the unrelenting hope that fuels her persistence in examining and questioning What is—the current structures in our educational system, and her courage to ask What if—unrelenting in her quest for what is possible. Her commitment to reflection and action is rooted in a deep-seated commitment to our children and belief in their potential to thrive in authentic and learner-centered school contexts. EDITORIAL REVIEW – Education in the United States is under assault from many directions. It is under funded and under appreciated. Teachers are leaving their beloved profession depriving the schools of their gifts. It is easy for teachers who are bombarded from every side with negative inputs to become deeply discouraged. This book is the antidote to that despair. What Is … What If takes a close look at the state of the educational system today and offers real insight into how changes could and should be initiated or if already in play should be supported and extended. For any teacher who wants to rekindle the fire of their passion for teaching, this is the book that will do it. There are very clear and cogent recommendations for making classrooms a true place of learning and development. The voices of teachers sharing their views are interspersed throughout the book and offer real ways to enhance the educational experience of students. Those voices are exciting and are contagious with enthusiasm for the teaching profession. They are voices we all need to hear. Underlying the entirety of the book is the author’s great understanding and deep compassion for those truly heroic people who have taken on the responsibility of our children’s education. 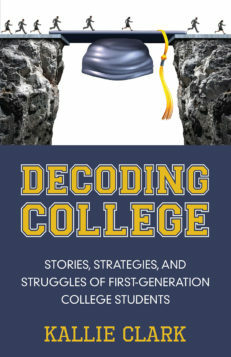 It is thoughtful and thought provoking and will benefit anyone concerned with the educational system in this country. EDITORIAL REVIEW – As a transformative educational instructor and leader, Dr. Reider challenges the traditional norms of education and helps future administrators reflect on what it means to be progressive practitioners. As my professor, she inspired me to continually question my assumptions and lead with a community mindset—a powerful combination that has served me well in my administrative career. EDITORIAL REVIEW – Congratulations! It’s brilliant! Dr. Reider, you have not only written an anthem for the need for positive change—you have provided explicit actions that would result in authentic student achievement and higher teacher retention. 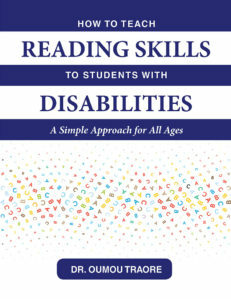 The voices of your teachers sing throughout the book, harmonizing with your text. They ring true and with power and passion. I was also quite pleased to see examples of secondary lessons and the strategies used by middle and high school teachers included. EDITORIAL REVIEW – Finding the right formula to educate meaningfully in early childhood through 12th grade is complex. Barbara identifies the issues and provides solutions to help us make sense of the complexity and what is really important to educate well for the future in the present. 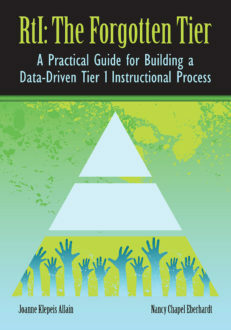 EDITORIAL REVIEW – Dr. Barbara Reider is an education visionary. In What Is … What If: Passion and Possibilities in Education Reform, Dr. Reider articulates her vision of what could be: an educational experience where “success” is built upon the natural curiosity of children, built into the creativity of the teacher, and becomes the outcome for each child. How do we get there? With clarity, Dr. Reider guides us on this exceedingly practical path: we listen to the voices of teachers.